John Calvin Coolidge was born July 4, 1872 and grew up in Plymouth Notch, Vermont, a village of 1300 residents. He worked hard as a young boy, but he had fond memories of growing up in a rural setting. He descended from Puritans who had come to America in the early 17th century. His father was civic minded and held several elected offices, even serving as a state representative and state senator. His mother, Victoria, loved nature and poetry. Unfortunately, she died when Calvin was 12 years old. Then five years later he experienced another tragedy when his sister Abigail died of a ruptured appendix. Calvin, at that time, was away at school attending the Black River Academy which was twelve miles from his home. He lived in Ludlow to attend the school and some weekends he walked home to see his family. He attended Amherst College in Amherst, Massachusetts. As a painfully shy young man, it was hard for him to get acquainted with his peers, but he did well in school and developed a dry wit which would be an asset to him the rest of his life. After he finished college he worked as a clerk in a law firm. He studied law at every opportunity, and though he never attended law school, he passed the test and became a lawyer. 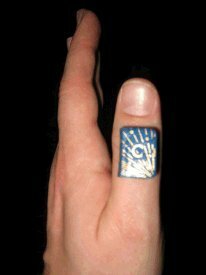 He settled in Northampton, Massachusetts. His skill and hard work were noticed by Republican leaders, and he was elected to be the town's solicitor, a person in charge of the legal business of the city. He met a young woman, Grace Goodhue, who was a teacher at the school for the deaf. Grace was just the opposite of Calvin. He was quiet and reserved, and she was talkative and vivacious. * They were married on October 4, 1905. They rented half of a two-family home, a place where they would live for many years. They had two sons, John and Calvin Jr. In 1905 he ran for a seat on the board of education and lost the election. It was the only election he ever lost. In 1909 he was elected mayor of Northampton. He was popular and made many improvements in the city. He was re-elected and as that term was ending, Republican leaders urged him to run for state senator. He won that election and served four years. Then he served three years as lieutenant governor of Massachusetts. People came to trust him. Next he became governor of the state. He was always looking for ways to save money. He reduced the number of state departments from over 100 to 20. He had three years in which to do it, but he accomplished it in one year. While he was governor, the Boston police officers organized a union and went on strike. More than 1100 officers refused to work and a crime wave resulted. Dozens of people were hurt and two people were killed. The Police Commissioner ordered the firing of the striking officers. The union leaders protested, but Governor Coolidge agreed with the commissioner. He said, "There is no right to strike against the public safety by anybody, anywhere, anytime." People across the nation praised his decision. He was re-elected. In 1920 Warren G. Harding was elected president and Calvin Coolidge was his vice-president. Two years later while Coolidge was visiting his father in Vermont, he received news that Harding had died. News traveled slowly in those days, but Coolidge received the news in the middle of the night by a hand-delivered telegram. At 2:30 AM his father, who was a notary public,* swore his son in as President of the United States. Then Coolidge went back to bed and slept until morning. 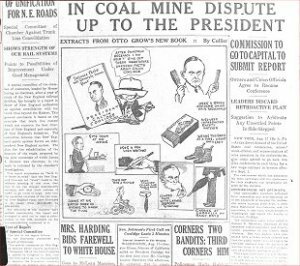 There had been scandal in President Harding's administration. It was referred to as the Teapot Dome Scandal. The government had issued some illegal oil leases. Coolidge was shocked. He said in a press conference, "Let the guilty be punished." He ferreted* out all the people who had been involved in the scandal and replaced them with men of integrity. He retained only those who had not participated in the scandal. The public was squarely behind him with their support. Political cartoonists ridiculed him and portrayed him as a dull, lackluster* character. And even though he could take decisive action when it was called for, some would call him the "do-nothing president". Coolidge didn't think the federal government should do anything that the states or local governments could do for themselves. If private citizens could handle something, he thought that was even better. He once said, "If the federal government were to go out of existence, the common run of the people would not detect the difference." This however, was not a reflection of the role of the federal government at that time. In 1925 he said, "The chief business of America is business." His course of action was to leave business alone and let them do their part by providing jobs for people. He didn't want to put restraints on businesses to hinder their progress. He supported high tariffs* on imported goods. But some groups suffered from his policies, mainly the farmers who couldn't sell their surplus products. Coolidge vetoed bills Congress passed to help the farmers. With Coolidge's support, Congress passed the Immigration Bill of May 1924. Fearing an influx of poor and uneducated immigrants, they limited immigration to 2% of the population of each nationality already settled in the U.S. in 1890. These were the only ones who were to enter the country. In 1924 Republicans overwhelmingly nominated him to be their presidential candidate. The campaign slogan was "Keep Cool with Coolidge". Right in the middle of the campaign their 16-year-old son Cal rubbed a blister on his toe from playing tennis without wearing socks. It became infected and he developed blood poisoning and died. In those days they did not have medicine that would have cured the infection. All the joy in life left the president. 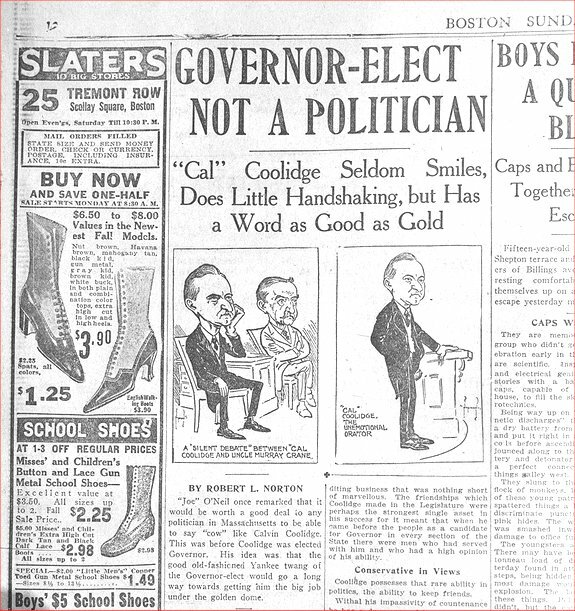 On election day Coolidge won 56% of the popular vote and 136 electoral votes to his challenger's 13 electoral votes. 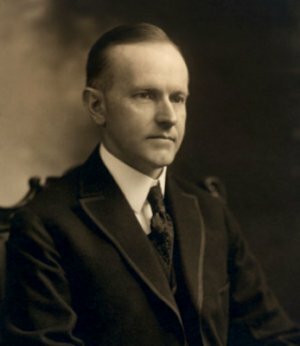 During his elected term Coolidge continued to press for fiscal responsibility in the government and a reduction in taxes. He said, "Every dollar we carelessly waste means that their (each American's ) life will be so much more meager." One of the major achievements of his administration was the Kellogg-Briand Pact which was written to settle international disputes without going to war. It was a good idea, but such an agreement was meaningless to tyrants* such as Italy's Mussolini and Germany's Adolph Hitler. They just ignored it. Charles Lindbergh became world famous when he flew his plane The Spirit of St. Louis from New York to Paris, France in a non-stop flight in 1927. Upon returning to America he was honored with a welcome in Washington D.C. 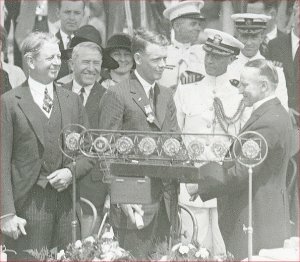 Listen to the welcoming speech given by President Calvin Coolidge. Coolidge was a very conservative person who lived a Puritan way of life, but who governed during a period that was diametrically opposed* to his values. It was the "Roaring 20's". Alcohol was prohibited by law, but it flowed freely with the help of the bootleggers. Many people lived wild, raucous* lives. Coolidge didn't enjoy social events, but his wife was a gracious hostess in the White House and they hosted many dinners. While he was president he planned simple menus for the dinners and sometimes made cheese sandwiches for his bodyguard. The family had a lot of pets. They had twelve dogs, seven birds, three cats, and two raccoons. It was quite a menagerie. Calvin Coolidge seized every opportunity to have his picture taken. 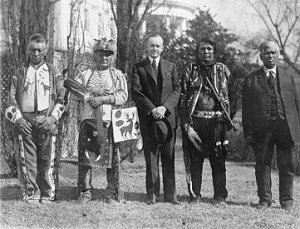 In this photograph he is shown with some Native American Indians. Other photographs show him wearing a Sioux war bonnet and posing with a group of Indian chiefs. Though some called him "Silent Cal", he made a lot of speeches and won the hearts of the people. He made wide use of radio broadcasts, the same medium Franklin D. Roosevelt later chose for his "fireside chats". While he was president he held 520 press conferences, more than any president preceding him or coming after his time. But he didn't talk about himself and rarely used the word "I". Concerning his reputation as a person who said little, it was reported that once a hostess said to him, "I made a bet today that I could get more than two words out of you." Coolidge allegedly replied, "You lose." The stock market was booming. Speculators were buying stock with borrowed money. It seemed the times were really good. People spent more and bought more. It was called "Coolidge Prosperity". The public thought he would run for a second term in 1928, but in 1927 he made a surprise announcement. "I do not choose to run for President in 1928". Maybe the death of his son had taken away any desire to continue in office. Perhaps he saw what was on the horizon. There was a calamity coming. In 1929 the stock market crashed, the economy was in shambles and the Americans were suffering in the depths of The Great Depression. The electorate blamed Herbert Hoover, the new president, but possibly some of Coolidge's decisions, or lack of decisiveness had contributed to the downfall of the nation. 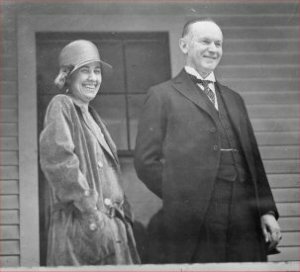 Coolidge and his wife Grace returned to Northampton where he wrote his autobiography. They lived there for a couple of years, then moved to a more private, secluded place to a house called the Beeches. On January 5, 1933 Calvin Coolidge died of a massive heart attack. He was sixty years old. This biography by Patsy Stevens, a retired teacher, was written February 26, 2013. Press "Go" to search for books about Calvin Coolidge. This page displayed 17,257 times.